These luxurious shampoo bars have been specially formulated to gently clean your hair as well has hands, face and body -- especially convenient when traveling. They're safe for all hair types, including color treated, naturally gray, children's and permed hair. Use as often as desired, a clean scalp promotes a healthy scalp, daily use is encouraged. Rub the bar between your hands and apply the lather to your hair or rub the bar directly on your hair. Work the lather through and rinse as usual. Daily conditioner is not absolutely necessary for some hair types, but is recommended to preserve the integrity of the hair shaft and prevent split ends. Many customers report surprise at how easy it is to comb through their hair after shampooing, even without a conditioner, and that their hair is full, shiny, and clean feeling longer. If you have hard water, the herbal-hair-rinses is recommended after shampooing for best results. Just apply enough to wet all of your hair, work it through and rinse it out or leave it in (the vinegar odor will disappear). 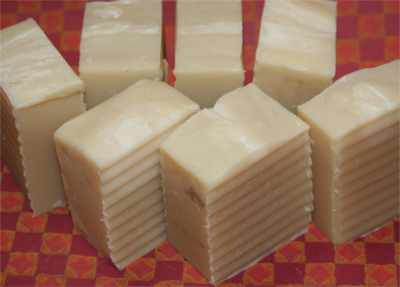 Our handmade shampoo bar gently clean without stripping the natural oils from your hair, leaving it healthy and shiny. I'm sure you'll be pleased and amazed at the results! You may never want to use bottled shampoo again. Please air dry your shampoo bar on a draining dish between uses to extent its life. It will soften if allowed to stay damp. Click here to learn more about the ingredients in our haircare products. You will be amazed at how healthy your hair will become with these hair strengthening formulas! Have fabulous, full, shiny, healthy hair. All natural ingredients of luxurious vegetable oils, herbs and pure essential oils. These shampoos make nice gifts. Many of our shampoos are Allergen-Free, made without wheatgerm oil or wheat products. If you are in need of wheat free soap, look for this symbol underneath the name. This soap was designed for my customers who regularly use the Oatmeal Tea Tree soap but occasionally want a soap that will provide the maximum in germ & bacteria protection, and especially for those suffering from PSORIASIS, eczema, and any skin disorder that escalates and spreads. Use this extra large bar for shampoo and body. Ingredients include *Foraha Oil*, tea tree, lavender, rose geranium. Your hair will smell delicious and look lustrous! Includes wonderful coconut oil, shea butter, aloe vera and essential oils for building hair strength; kaolin and bentonite clays for deep pore cleansing and smooth shaving, so go ahead and take your razor in the shower! Great for all hair and skin types, yes - your body will love it too! An all natural moisturizing base of coconut oil, olive oil, avocado oil. Infused calendula and chamomile herbs and essential oils of lavender & nutmeg. Normal to Dry hair, especially blonde and sandy colored hair. Color protect. Not a strong scent -- smells fresh, a bit herbal. With nourishing AVOCADO, wheatgerm, coconut and olive oils; mint and rosemary herbs; and essential oils of grapefruit, rosemary and spearmint. Rhassoul Body & Hair makes a great shampoo. It lifts dead skin cells, stimulates the scalp and helps restore luster to over-worked, over-processed hair. 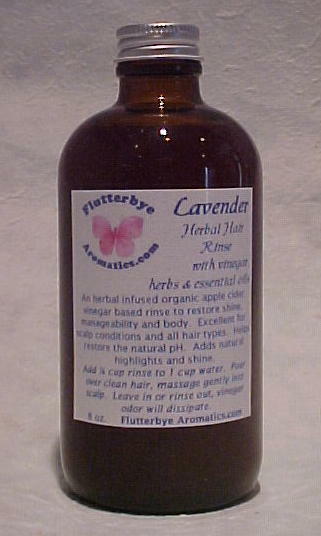 Simply a great shampoo with olive oil and essential oils of rosemary & lavender for their scalp stimulation properties. Assortment of FOUR shampoo bars. I'll choose for you, or if you know what you want, let me know in the comment section at checkout and I'll send those if I have them in stock. These bars will be labeled. A luxurious shampoo made from our original formula minus the scent. Perfect for anyone and everyone. The whole family can enjoy this shampoo, and travelers too, it's a head to toe rich lathering shampoo/body bar designed to provide nutrients for your scalp and hair. Luxurious shampoo for those of us with thin, fine or limp hair in need of a bit of perking up, or anyone who would like more BODY! This shampoo really works and is ALL NATURAL. Our shampoo bars are so popular that it’s rare if an order goes out without at least one. But occasionally a customer will mention "icky hair" when first trying the shampoo bar. Oh – yes, some people have hard water that does not respond well to the shampoo bars (the minerals interfere with the ability of the soap to be rinsed off your hair) . Or – there may be so much build-up of chemical residue on the hair from commercial shampoos that it will take a week or more of using only the natural shampoo bar and the vinegar rinse to really clean the hair. Hair is a modified form of skin, and works best when it’s slightly acidic. Hair also has a cuticle which opens when we shampoo our hair, and this makes the hair feel rough, or more coarse. Vinegar closes the cuticles, helps to restore the acidity, and removes any residue left behind. Your hair has more shine (any residue coats the hair, causing it to look dull), less tangles (the cuticles are closed, the hair slides more easily) and a healthier scalp. Want more volume and stronger hair? The Herbal Vinegar Rinse can improve your hair's ability to absorb and retain moisture (preventing dryness and breakage) by sealing the hair cuticle. Also, this rinse is a great way to "detoxify" your scalp (dandruff, sores) by removing any hair product build-up while preserving your natural oils. ACV balances pH levels through its acidity and helps stabilize the proper acidity of hair, so we recommend applying this rinse after shampooing. Note: the higher the pH levels, the more hydrogen ions there are, which contributes to better elasticity and overall volume. Leave the rinse in or you can rinse it out, but the vinegar smell will dissipate so it’s really not necessary to rinse it, leaving it In helps even more with tangles and itchy scalp. Among the most frequent causes of stressed scalp are hair abuse due to improper hair care, individual hypersensitivity to certain food, personal care or hair care ingredients, psychological stress, insufficient hair rinsing after shampooing the hair, rinsing with highly chlorinated water or water containing unhealthy ingredients. Selection of a proper shampoo which will not irritate the scalp (any of our all natural shampoo bars), is essential for successful reduction of scalp stress. With any shampoo, it is important to rinse the hair to remove the residual from the hair roots. In fact, remaining detergents quite often are the primary cause of scalp irritation, seborrhea and hair loss. Concentrated shampoos and combined shampoo/conditioners make it very difficult to wash out the detergents. For truly healthy hair, avoid these. My whole family loves herbal rinses, including the Pooches! These rinses will add shine and body to your hair while restoring the pH of your scalp. The rinses are especially helpful for people with dandruff, dry scalp, or itchy scalp, but are good for everyone. The organic apple cider vinegar is infused with specific hair enhancing herbs, then combined with wonderful essential oils. The rinses are very helpful when transitioning from commercial shampoo to our all natural shampoo bars. The herbal rinse is concentrated, easy mixing directions are included -- you will need a small squeeze bottle (or cup) to mix your herbal rinse with water before applying. They’re gentle enough to use on all hair, babies and dogs included. These rinses will remove excess soap or residue from hair. Infused organic herbs: aloe vera, amla, burdock root, chamomile, green tea, hibiscus, horsetail, nettle, yarrow, witch hazel; with organic apple cider vinegar, yarrow hydrosol, chamomile hydrosol, witch hazel hydrosol. This rinse is made when ordered and should be refrigerated for best storage. Please give me several days notice before you need it. For all hair types. This fantastic herbal hair rinse focuses on improving the overall health of the hair while promoting hair growth. Organic rose petals, org rose buds, org rose hips (great source of Vit C), and organic ACV nurture the hair structure and root, balance the pH of the scalp, and fortify the hair follicles with vitamins, minerals and nutrients. Leaves hair glossy, silky and soft. Prevents hair loss when used routinely. Benefits of organic Peruvian raw cacao nibs for hair include increasing blood circulation to the scalp which helps to increase the growth of healthy and lustrous hair. As a circulation booster, cacao helps reduce hair loss. Cacao contains anti-inflammatory properties which will help heal and minimize scalp infections. "Cacao" is the bean from the Cacao tree (Theobroma cacao). Cacao pods grow from the trunk and limbs of the cacao tree, and raw cacao beans are found inside the pods. If or when the cacao bean is roasted, processed, and powdered, it is then "Cocoa". Ingredients: Infused organic herbs: rose petals, rose buds, rose hips, horsetail, marshmallow root; organic Peruvian raw cacao nibs,organic apple cider vinegar, vegetable glycerin, organic rose hydrosol, grapeseed extract, pure essential oils. stimulate hair growth; and help control dandruff or seborrhea. Order Rosemary Hydrosol from the Hydrosols page. 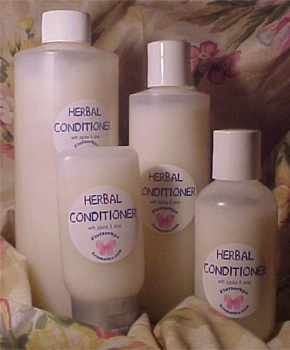 The Herbal Conditioner enhanced formula contains the moisturizing properties of Rosehip Oil, Panthenol Vitamin B, Organic Hydrosols and Herbal Extracts including Aloe Vera and Organic Green Tea. It has softening properties with the addition of Oat Extract and Wheat Proteins. The pH of Herbal Conditioner compacts the cuticle layer of the hair, which will result in shiny, bouncy hair that is not weighed down. Follow shampooing with a light coating of Hair Conditioner to lower the pH of your hair and to leave your hair fresh, easy to comb, and increase the elasticity of your hair. For best results, do not put the conditioner on your scalp and living hair follicles, apply a small amount of conditioner along the length of your hair to the ends. For intense conditioning, apply plain Whipped Shea Butter once a week as a hair mask.. This is a luxurious, lightweight conditioner that smells great, will improve the health and elasticity of your hair, and will leave it shiny and bouncy, not heavy. Contains yummy ingredients such as organic aloe, organic lavender hydrosol, organic chamomile hydrosol, wheat protein, Panthenol Vitamin B5, veg glycerin, organic rosehip seed oil, black willow bark extract, organic lavender essential oil. This superb hair formula contains exceptional oils including Argan Oil, emu oil, seabuckthorn extract, shea, olive and coconut to strengthen and nourish all hair types, as well as lavender, rosemary, and orange essential oils for revitalizing the scalp and hair. Encourages hair growth, de-frizzes, detangles, renews elasticity and helps repair split ends. Routine use produces strong, silky, shiny hair. Apply from roots to ends, cover head with plastic cap, leave 30 minutes or overnight. Follow with one of our nourishing shampoo bars and conditioner to complete the treatment. Avoid sulphates (detergents) in liquid shampoo. Hair is composed of a strong structural protein called keratin. This is the same kind of protein that makes up the nails and the outer layer of skin. Hair is a remarkably tough material, but over time many factors can wreak havoc with its natural properties. The hair becomes weakened, loses its elasticity and shine and becomes dull, brittle and eventually breaks. This process is called weathering. Emu Oil not only penetrates through the three layers of hair to deliver moisture and nutrients, but it helps the scalp itself to thicken and provide a healthier environment for hair follicles. Many people have reported hair regrowth after using emu oil. Make your own after-shampoo herbal rinse with this ready-to-use blend of great herbs for hair! Simple instructions for making the rinse are included. Aloe is well known as a potential stimulant of hair growth; fights frizz; conditions and soothes the scalp and regenerates the hair cells. Properties: Aloe-emodin, arginine, magnesium, salicylates, serine, vitamin C, and complex polysaccharides including acemannan. Amla is an excellent hair conditioning herb that provides scalp-penetrating nourishment. It strengthens hair at the root, promoting stronger, healthier new growth. It can help slow or prevent hair loss, shedding, and breakage, prevents excessive hair fall and premature greying. This herb dominates the Flutterbye shampoo bar formulas. Burdock root is helpful treating scalp problems, especially itching and dandruff. It also improves hair strength, restores shine and reverses thinning. The rare long chain of essential fatty acids helps to maintain healthy scalp and hair and aids in improving shine and elasticity. Burdock Root also stimulates blood flow to the scalp, encouraging growth. It is also rich in silica and phytosterols, which soothe irritated scalp conditions like dandruff, psoriasis, seborrhea dermatitis. The mucilage in Burdock Root is great at providing slip, making it easier to detangle hair. Calendula is rich in minerals that are soothing to sensitive scalps, helps prevent damage by protecting hair from free-radicals. It also contains some antibacterial properties, helping keep the scalp and hair clear of infection and bacterial growth.Chamomile is a great conditioner for damaged and dry hair and is also beneficial for oily and normal hair; helps restore shine and brings out the natural highlights for blondes. It also helps to strengthen the hair to prevent breakage, tangling and split ends. Chamomile provides soothing and anti-inflammatory properties to your hair and scalp. If you suffer from itchy, irritated, or sensitive scalp, a chamomile rinse or products containing chamomile can help get your scalp and hair growth back on track while promoting shine and sheen. Green Tea Major constituents include polyphenols, carotenoids, tocopherol, Vitamin C, zinc, selenium, manganese and chromium. Most of these, but especially Vitamin C, tocopherol (Vitamin E), carotenoids (Vitamin A), zinc and selenium are known to prevent, stop and reverse hair loss. Green tea is thought to be a powerhouse when it comes to blocking DHT, which leads to hair loss. Hibiscus has many beneficial uses. When steeped, the pinkish-red hue given off contains lots of mucilage and plant protein that is great for hair. It promotes growth and aids in the treatment of scalp conditions like dandruff and hair loss. It also aids in moisture retention by sealing the cuticle, which also helps promote shine. The high nutrient content of hibiscus makes it ideal to promote healthy hair growth and strength. Horsetail is a rich source of silica and is known for its rich amino acids and phytosterols which aid in strengthening hair. It promotes strong, sleek, shiny and manageable hair. It also stimulates hair growth as it enhances scalp circulation. The silica content of horsetail is useful in hair growth as well as improving the appearance and strength of hair shafts. Horsetail is also known to reduce the buildup of natural oils that tend to form on the scalp which can lead to blocked hair follicles or may compromise the health of the follicles. Nettle is an excellent hair tonic, promotes hair health and hair regrowth; rich source of Vitamin A and C. It is effective against hair loss as it inhibits the production enzyme which is the root cause of hair loss. Rosemary encourages hair growth by improving blood flow and circulation to the scalp which results in strong, healthy hair growth. Rosemary also increases manageability and adds shine, stimulates the roots to prevent hair loss and to produce new growth; nourishes the scalp to prevent dandruff; slows premature graying . Sage is an important herb for proper hair care. It is effective in treating scalp infection, dandruff and oily hair problems. It is said to lessen hair loss and restore hair color. The astringent properties also make it ideal to eliminate buildup from the hair and scalp without drying it out. Yarrow strengthens the hair follicle and natural color, with consistent use will diminish grey and return natural color. Witch Hazel helps improve the blood circulation at your scalp. Improved blood circulation will stimulate natural hair growth. Take a look at the list of vitamins on this page to determine if you need to increase your vitamin and supplement intake. Many of these vitamins are concentrated in certain foods, and some need to be taken as supplements. Vit A, Vit B, Folic Acid, Vit C, Vit D, Vit E, Omega 3, Zinc, Beta Sisterol, Iron, Grapeseed, Amino Acids, Inositol, Biotin.